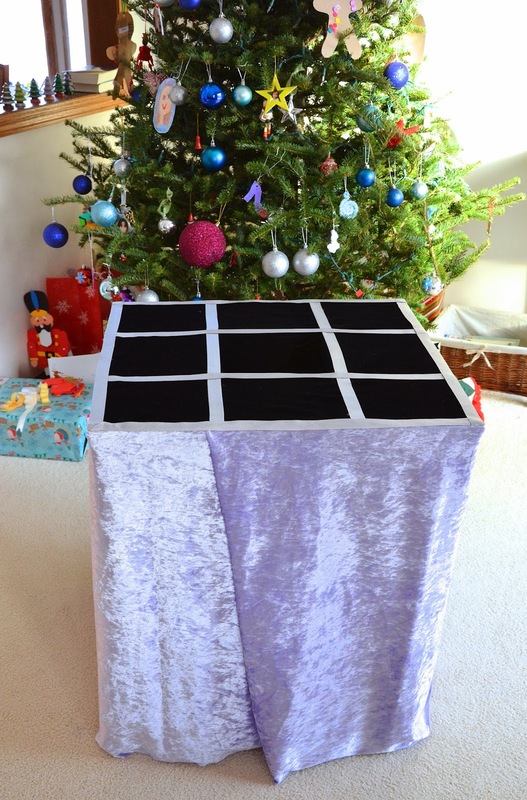 So, this is Emily's other magic-and-illusion handmade Christmas gift. It's cardboard (and some fabric glued on). And it's just a table. Right? It's that cunning table that magic people put top hats on top of and from it pull out all manner of impossible things - rabbits, a mile of multicolored silk scarves, the Dead Sea Scrolls, an entire family of doves, the Statue of Liberty, the complete works of Shakespeare, stuff like that. Like the color-changing handkerchief in the previous post, I made it with instructions from this wonderful book. 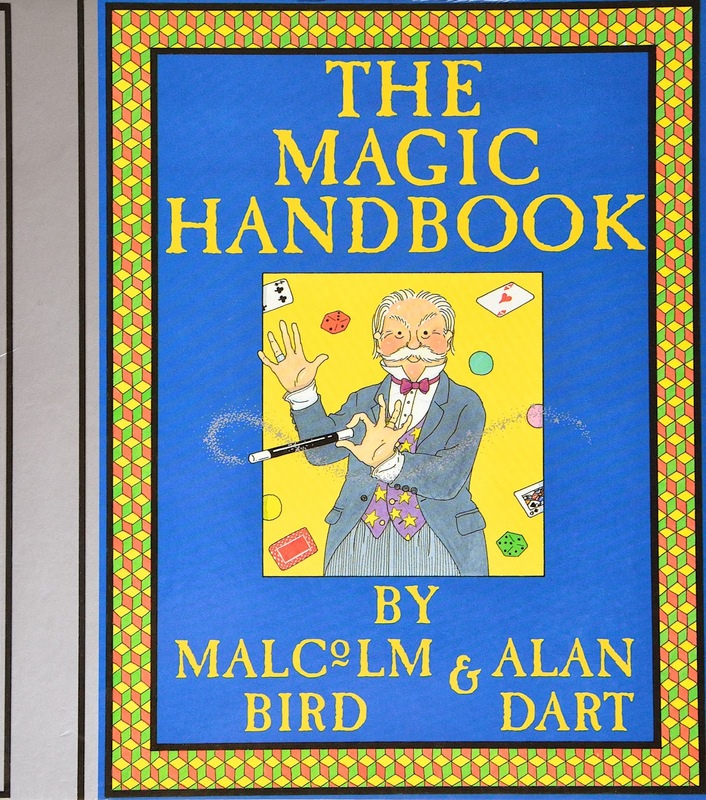 Incidentally, if your kid is into DIY illusion props and top hats and capes and costumes, this book is fantastic. So here's the how-to for that magic table. 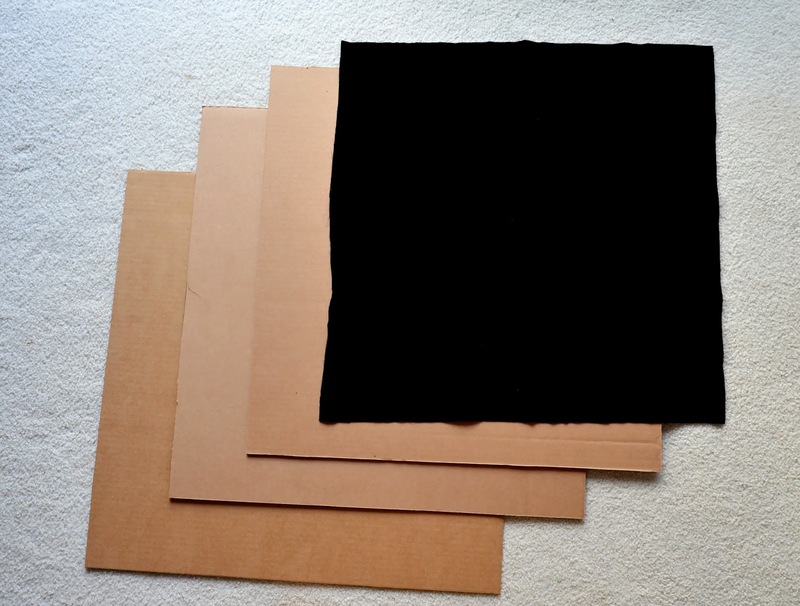 I started with three (the book suggests two but I believe you can never have too much cardboard) squares of corrugated cardboard, and one square of black velvet, all 24" x 24". 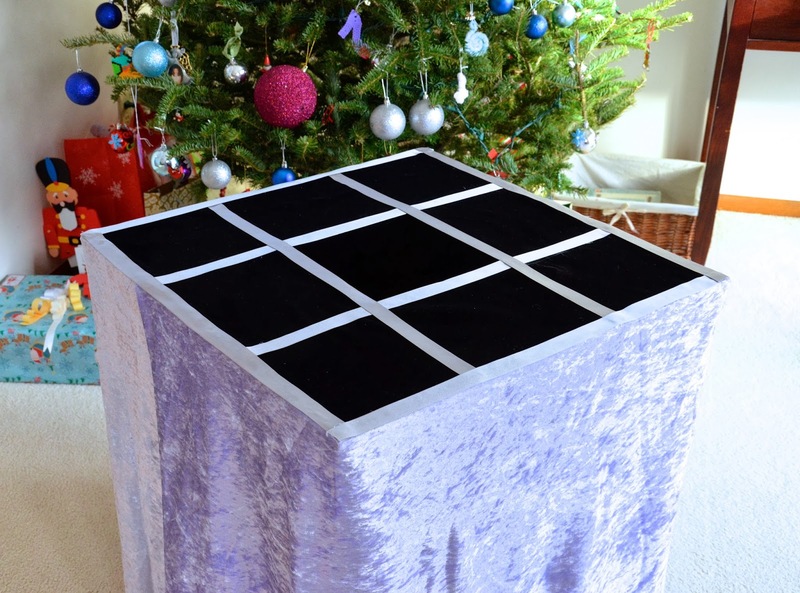 This will be the tabletop. Do not use quilting cotton, flannel, interlock knit, duckcloth, Japanese organic cotton or even velour - only velvet. You can use cheap velvet or expensive velvet; the important thing is that it must be velvet. Velvet is a magician's best friend because it absorbs light and reflection so perfectly that it in itself is an illusion. 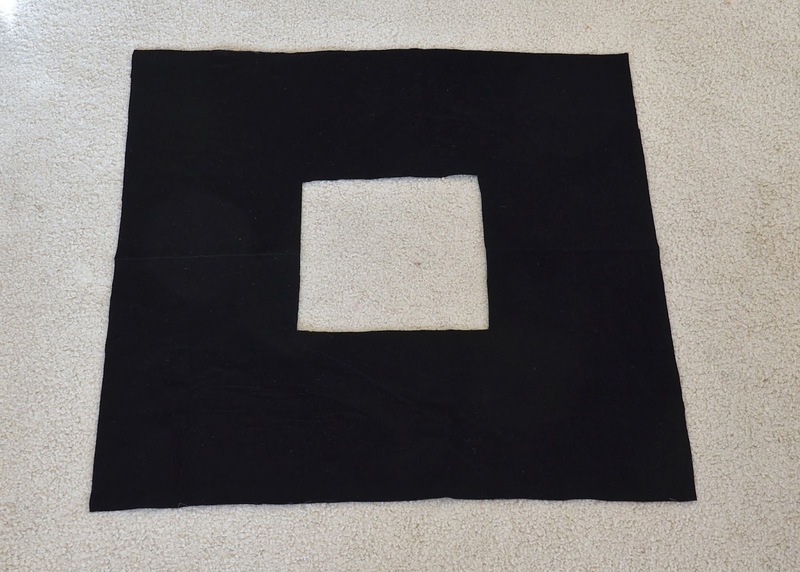 You also need a long strip (or join shorter pieces) of that same black velvet, 33" x 12". With RS together, fold it along its short side into a 16.5" x 12" rectangle and sew its short sides together with a 1/2" SA. You will now have a squat cylinder that is 12" tall. Notice that I used the selvedge for the top edge, purely for visibility in this tutorial. You shouldn't do this - and the reason will be clear in later steps - just cut the entire bag completely black. 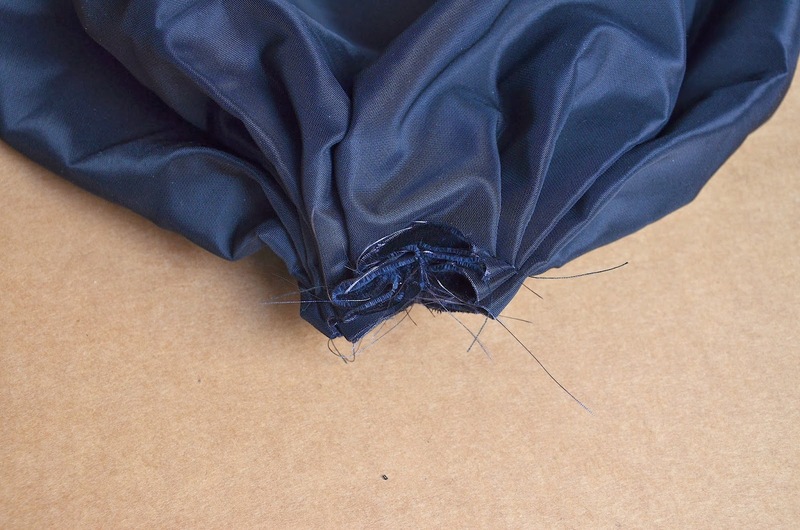 Gather or pleat its bottom edge to make a shallow bag. Because the pile of the velvet creates very thick gathers, I pleated the bottom instead, by folding it into pleats and machine-stitching across the stack of pleats. This is the end of the sewing part of the construction. Set this aside. 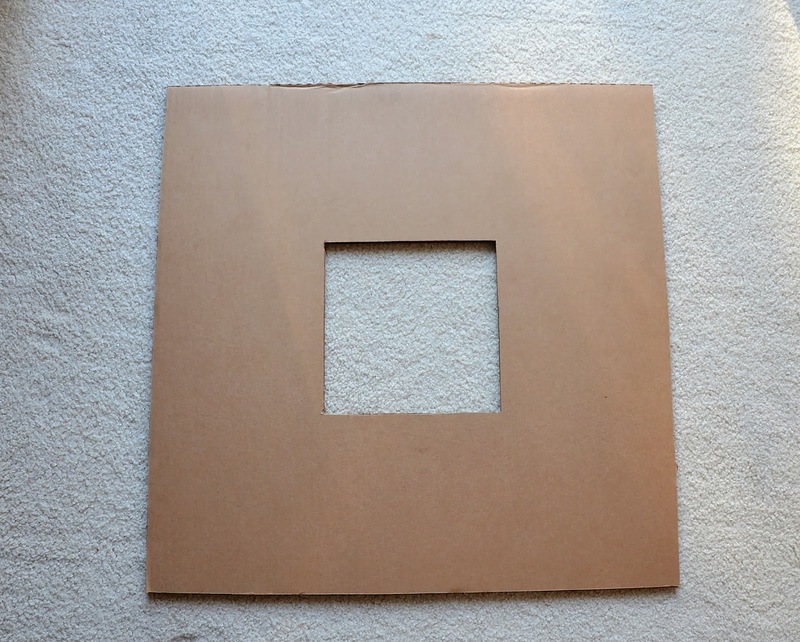 Cut a 8" x 8" square hole in the middle of each big cardboard square. Discard the cutouts. Hot-glue the cardboard layers together to make a thick stack. Ensure that the flutes (the wavy lines) of each layer are perpendicular to the layer above and/or below it. This strengthens the composite stack. 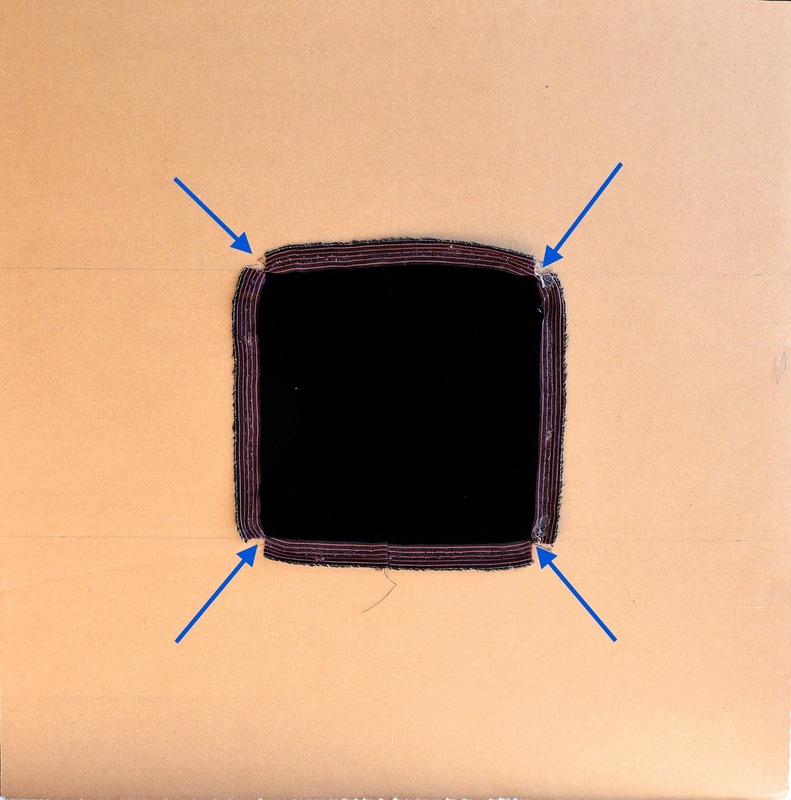 Cut 1/2" deep slits 8" apart along the top edge of the velvet bag you made earlier (blue arrows). This will divide the top edge into 4 equal sections, which you will then hot-glue to the edges of the 8" x 8" square hole in the cardboard. 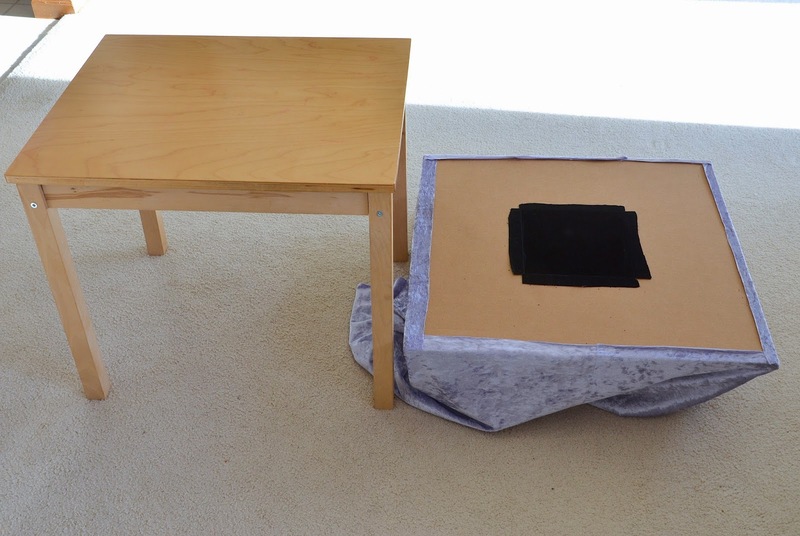 You will now have a black velvet bag suspended from the hole in the cardboard tabletop. Find a cardboard box that is at least as big and deep as the bag when it is suspended. 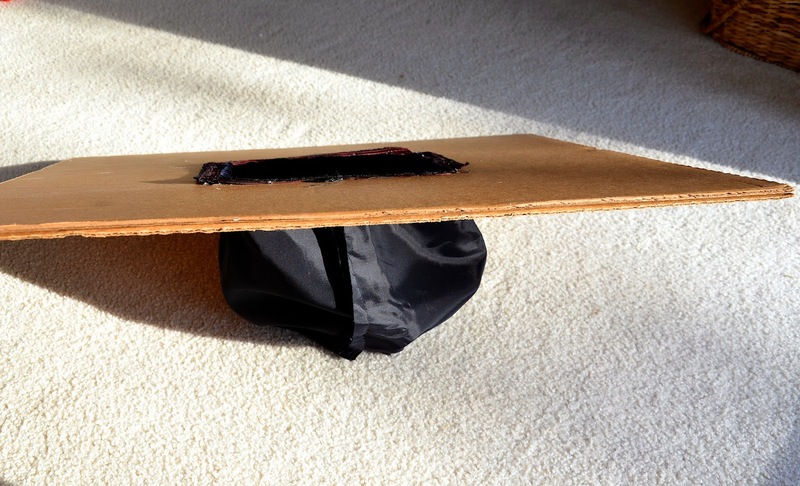 Glue the flaps of the box to the underside of the table top so that the bag sits freely inside it. At this point, I needed to cover that visible, stripey selvedge with strips of black velvet, but you wouldn't have to, because you wouldn't have used the selvedge. 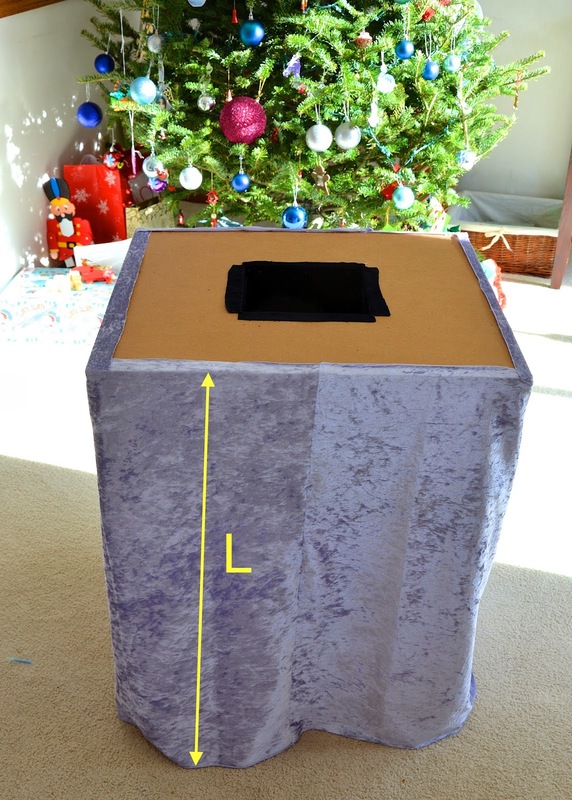 I also cut a large piece of fabric (I used velour because it was what I had - you can use any fabric, even quilting cotton) wide enough to wrap around the perimeter of the cardboard tabletop, with some overlap (all those red arrows). 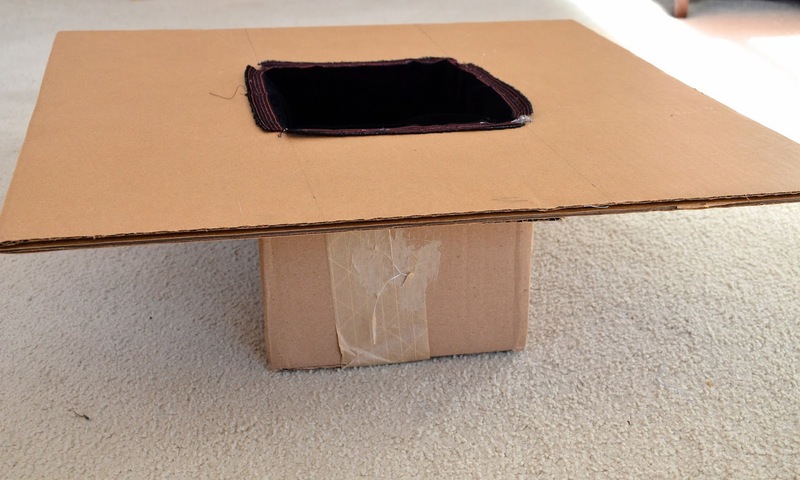 The book suggests making the entire table out of cardboard boxes - just hot-glue a stack of boxes to get the tabletop to the right height. We don't have the luxury of space, so I made mine with just that one box, planning to have it sit on one of our kid tables when in use. I figured it would be easier to store than a full-height cardboard table. plus an inch to glue onto the edge of the cardboard tabletop. 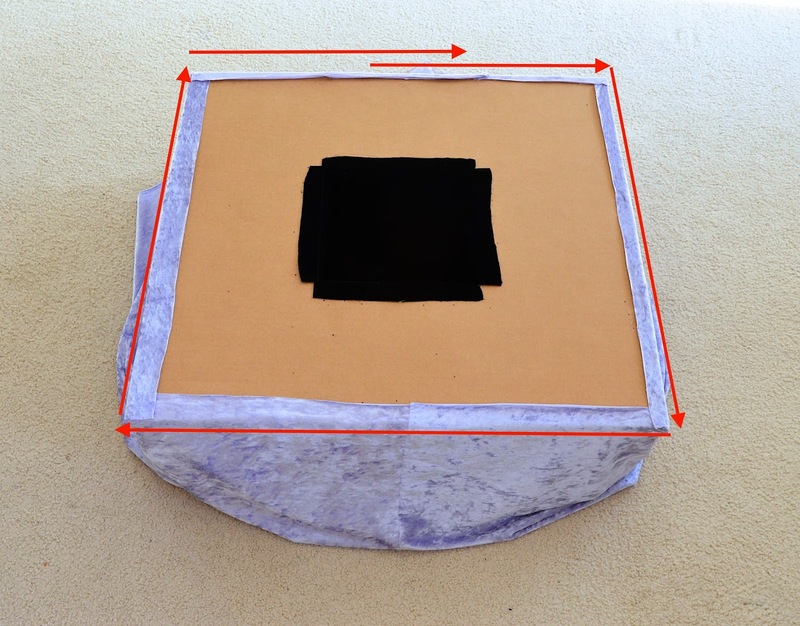 Then I hot-glued the fabric all around the perimeter of the cardboard tabletop. 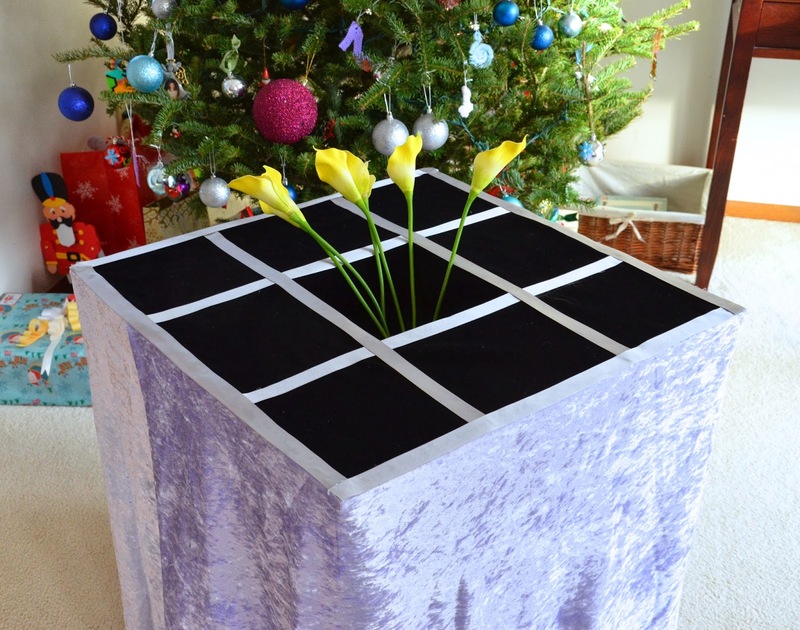 Take the 24" x 24" square of velvet and cut a central square hole that's a little bigger than 8"x 8". Hot-glue that onto the cardboard tabletop. Look - it's already hard to see the hole+bag, unless you know it's there to see. 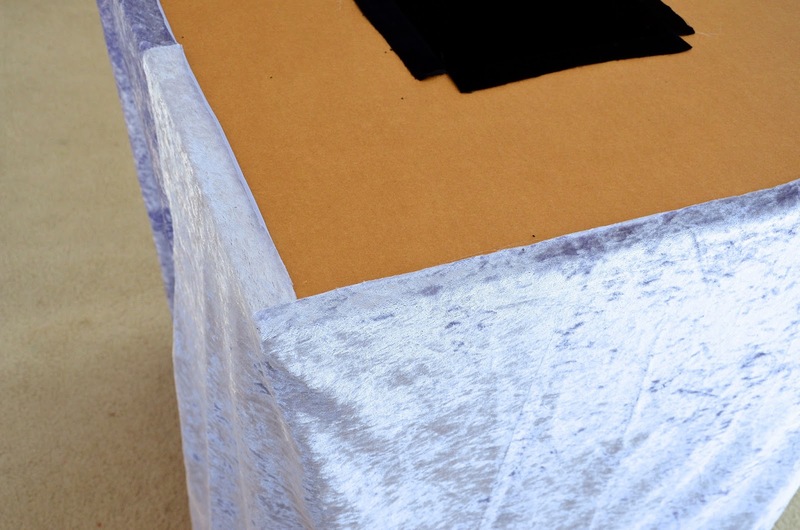 Trim the edges of the velvet if necessary, so that none of it protrudes over the edge of the tabletop. to the point that your audience will need a lot of help to actually tell that the hole is even there. Here is the finished table, which, being hollow underneath, provides a convenient storage and hiding place for other props. Good for hiding and extracting bunnies. 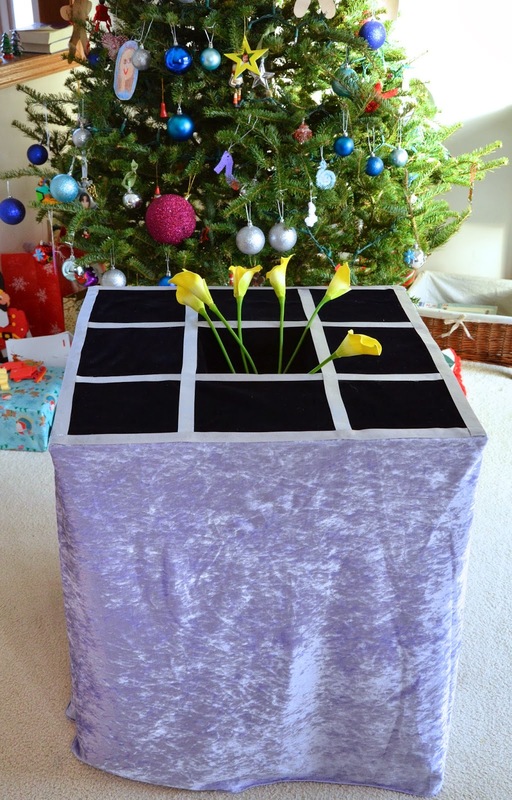 To use, drop a large handkerchief (or top hat with false bottom) over the middle hole and sneak your hand under the handkerchief (or into the hat) to retrieve objects pre-concealed in that black velvet bag. And that brings us to the end of another manic year of crafting. See you in 2014, and may your new year be full of good health, rich relationships and more time spent on a good book than Pinterest (note to self: take own advice)! Happy New to you and yours! 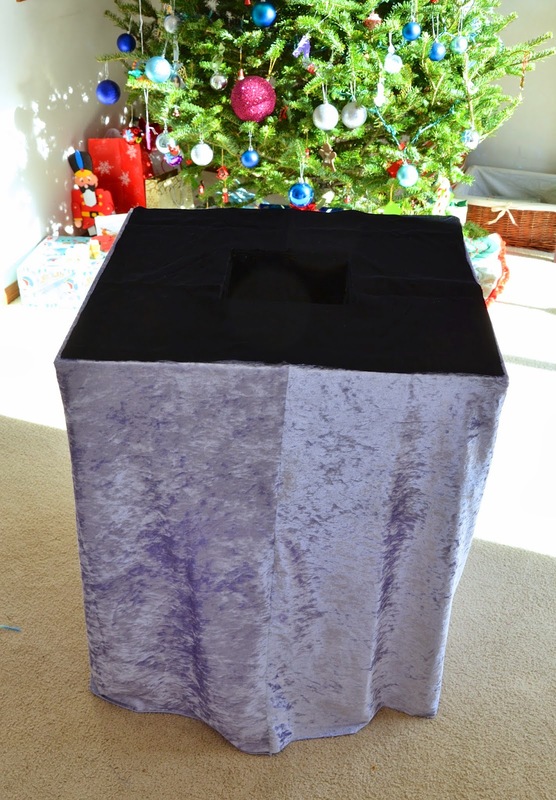 Some cardboard and fabric, and voila, a magician mother! Thanks for these magic props - so simple and yet so very 'magical'. Its such a lovely gift for kids! Hope the new year pulls out lots of real magic from its hat for you. Awesome gift! I bet your children love it! OHMYGOSH! That is so cool! 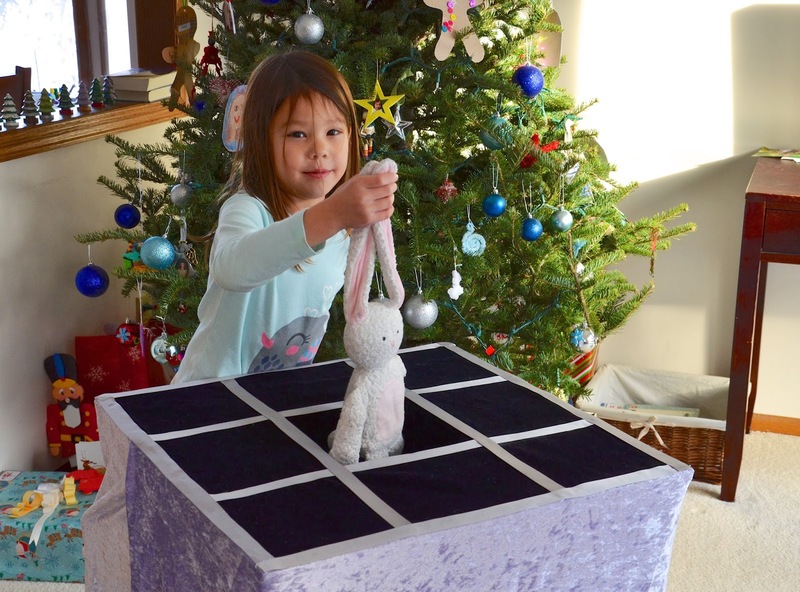 I am tempted to make one and my kids aren't even into magic (yet). This is so cool!!! Love that you designed it so that it wouldn't take up more space than necessary, too. Still struggling to fit our family of 6 into the condo we moved into that is really designed for a couple with one, maybe two kids at most! You're the magician! This is fabulous!